Dawn Seegars is a native of Fayetteville. She is a graduate of South View High School, and earned a nursing degree from Bladen Community College. As a bi-vocational worship leader, Dawn’s passion for worship ministry is born out of her love for God, and for His people. She realized early in her walk with the Lord that His children were created to worship Him. Her heart’s desire is to see disciples of Christ commissioned for personal and corporate worship, and she works diligently at not only leading corporate worship, but raising up new musicians and vocalists to be leaders in worship as well. Three years ago, Dawn was led to begin Tempo, The Temple Arts Institute, a ministry of Temple Baptist Church, where she and other instructors help train even our youngest musicians through individual voice and piano instruction, and Kindermusik. 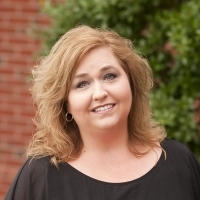 Along with her heart for worship ministry, Dawn has a heart for missions and outreach. She involves the entire worship arts ministry in several outreach opportunities each year, and has been on various mission trips locally and internationally. Dawn is married to her best friend, Bo, and they are parents to 7 children, ranging in age from 26 to 7. They enjoy traveling, live music, and sports, but are happiest when their entire big family is together.